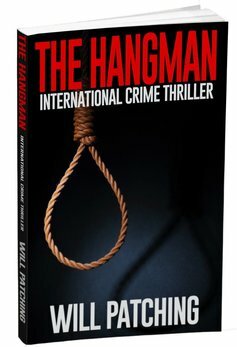 The Hangman will be soon available for pre-order. If you would like a peek now, you can read the opening scene here... Enjoy! The biochemist’s gas mask was almost seven years old and, although obtained from a surplus military supplies store for just twenty pounds, it was doing the job as advertised. Only the stink of rubber reached his nostrils, but he was no longer aware of the odour as his mind was wholly focussed on the task he had set himself. Sweat, evaporated by the heat of his brow, condensed on the inside of the cool glass lenses, while his gloved hands trembled slightly as he manipulated the mixture. Verging on exhaustion, he had worked straight through for twelve hours and was still not finished. His belly grumbled with hunger while his head pounded from dehydration, low blood sugar and stress. Despite his discomfort, being unable to eat or drink during this phase of his preparations was a familiar hardship for him – he was used to fasting for Ramadan – and the prospect of what he would achieve kept him motivated to make everything perfect, as best he could. Almost all the items spread before him had been purchased from retailers whose customers were generally innocent consumers, going about their daily business, and none with mass murder on their minds. Castor beans were one of the key ingredients in his recipe, and, like the other supplies, these had been obtained by members of his imam’s network. The appropriate quantities had taken longer to acquire than expected, delaying his work, but now he had all he needed. Purchased in small batches to avoid suspicion, sourced from numerous garden centres dotted around the country during the previous six months, then sent to a safe house by post. All were similarly packaged in brightly coloured envelopes displaying the beauty of the plants that would grow from the giant seeds contained within. A keen gardener would have nurtured them, burying them in fertile compost, keeping them warm and moist, but not too wet, thereby creating tropical plants that would eventually blossom in vivid red and orange hues somewhere in suburban Britain. The biochemist had less decorative plans for his supply of seeds. He had already boiled and crushed them, had treated the resulting pulp with solvents, and was now mixing the ricin residue with a concoction he had devised while working on a project for his friends in Syria the year before. A sackful of cicuta virosa roots had already been processed, along with a variety of other organic ingredients he had treated, and all were now ready to mix into a potent cocktail. This was the most dangerous phase, and the cellar he was working in would not be safe for humans to occupy for a considerable time after he had finished. This was of no consequence – he would not be coming back here again. His days in London were almost over. Early on Thursday morning, he would be on a ferry to France. Shortly thereafter, he would take the express train to Marseilles before collecting his new car to enjoy the spectacular coastal drive to his beachfront home. Also brand new. As the mixture cooled and the crystals gradually disappeared into the colourless viscous liquid he was creating, he nodded to himself with satisfaction. The resultant gel was odourless and posed little threat to him from inhalation, but the various contaminants inside the room meant he would be wise not to remove his protective clothing. Certainly not the gas mask, or even the cumbersome thick rubber gloves that made the job twice as difficult, but at least the end was in sight. On another workbench, off to the side, stood hundreds of cans of carbonated soft drinks. Three highly popular brands, all legally purchased from various retail outlets spread across the capital, each bearing a sticky label with the buyer’s name and location, lined up in shallow plastic baskets ready for the biochemist’s attention. The choice of store had been left to the purchasers. They were tasked with buying specific products, on sale individually, each with one critical element he had specified. Every container had to feature a ring pull designed for convenient opening. This simple utilitarian device enabled the biochemist to create a potent weapon. With a calibrated pipette in hand, he treated each can with a tiny quantity of his customised gel, carefully dripping a lethal dose onto the metal tab that sealed the opening and kept the contents fresh. Once his painstaking task was complete and he was satisfied the cans were all suitably toxic, he used a hairdryer to ensure the gel hardened into a tiny, colourless spot on each of the aluminium tabs. After the last can was ready, he went back to the first and held it up to the light to check his modification was indiscernible to the naked eye. Seventy-five minutes later, he was satisfied – all the cans had passed his quality control check. He enjoyed a moment of self-congratulation, sent a prayer to his god, repeated his vows to avenge his family and their needless violent deaths at the hands of the Crusaders, then cleared away the evidence of his activities. Apart from the trays of cans, every item was thrown into heavy-duty hazardous waste sacks, including the residue from the raw materials, his glass jars of chemical ingredients, filters, test-tubes, gas burners, and other paraphernalia, with only a single metal flask remaining on his workbench. Enough of his lethal ricin-based gel to kill thousands of people. Ready to be used by others in the holy war he was committed to. With a final glance around his temporary laboratory, he tapped a code into a touchpad by the door, and the lock released. He murmured another brief prayer before opening, then carried the racks of drink and stacked them in the antechamber leading to another locked door, several paces beyond the first. After retrieving the flask, he carefully fitted it in the bespoke recess in the protective foam lining inside a rugged tungsten-steel briefcase and locked it. Closing the door on the contaminated cellar for the last time, he was able to shed his protective gear. That was dumped in another hazardous waste sack at his feet, sealed, then double wrapped inside one more. He tied that off as he stood naked, shivering in the cool subterranean atmosphere. Was it from the adrenalin hangover or the chill? He couldn’t be sure, but felt the tension roll off his aching shoulders as he stepped into the shower cubicle, eyes drawn to the deadly pile of stacked cans opposite. A dark stream of urine relieved the pressure on his bladder and kidneys, and for the next ten minutes he cleansed himself with soap and hot water. Refreshed and re-invigorated, he towelled dry before dressing in the clothes he had left on a shelf beside the shower, vacuum sealed in plastic to prevent any cross-contamination. Once ready, he used his thumb to press a red button by the metal door, could hear the faint buzz echoing in the corridor beyond. Moments later, the door opened, and a familiar bearded head appeared, ragged eyebrows lifting in question. No words passed between them, but the biochemist nodded and received a mirthless grin in reply. ​Join my Readers Group to be informed of my new releases and much more besides!